Rayban 3716 1875851 Clubmaster Metal. The metal clubmaster range by Ray-Ban offer a new, contemporary look whilst maintaining all the original features of the standard club master range. They are available to purchase in several different colours, both frame colour and lens colour, each giving a unique stylish look. The much loved shape from the original club master selection has been used, however Ray-Ban have added a retro look by introducing the metal temple sides (145mm) and bridge (21mm). Due to the simple, yet stylish square shaped frames the metal club master sunglasses are suitable for all age groups and are unisex. The sunglasses are stiff and sturdy, but are light weight and delicate on the face meaning long wear is a comfortable experience. These clubmaster’s would be ideal for somebody that wants to look stylish whilst outdoors, and also exposed to a lot of sun. 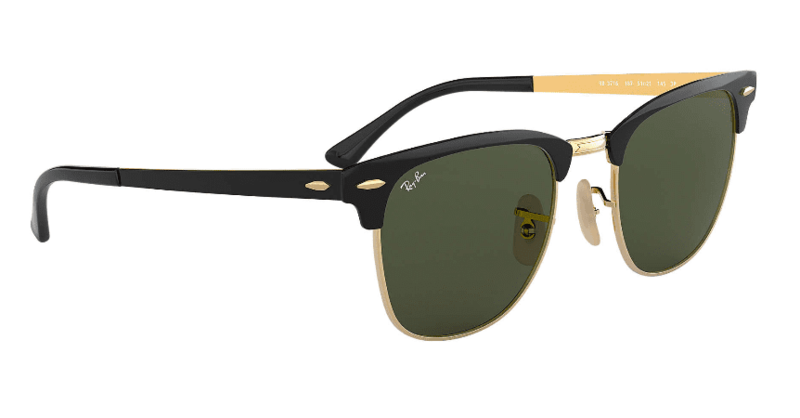 The metal club masters offer great UV protection and are new to Ray-Ban. This unique, retro range will last in both style and durability for years to come. In this particular lens colour of green, it warrants clearer vision for long periods of time. This is because green lenses reduce brightness significantly whilst maintaining neutral colours that do not distort vision. The green lenses offer great protection from UV rays which can decrease chances of developing eye conditions such as Macular Degeneration or Cataracts. The green lenses simply absorb the light, but do keep light as natural as possible offering clear vision. These lenses would be suitable for people that enjoy being out doors or participate in out door sports such as golf or cricket. Although these lenses are practical, Ray-Ban have still allowed for a stylish look. The green lenses give a unique look and would be perfect for somebody that wants to look stylish and up to date but also requires significant protection from the sun whilst maintaining excellent visual acuity. The timeless black frame is also available with different frame and lens colours either in grey gradient or a classic blue affect, allowing you to personalise the frame to suit your style.